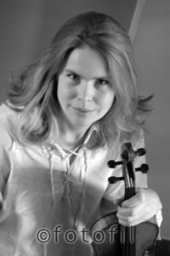 Violinist Sigyn Fossnes is associate professor at Barratt Due Institute of Music, Norway. She teaches both young talents and students, and her students have received a great numbers of awards and prizes. She is also involved in Barratt Due’s teaching program, and is now setting up the same program for violin professors in Hanoi, Vietnam. She is also co-leader for “Valdres sommersymfoni”, the Norwegian music summer school. Sigyn Fossnes is educated as a violinist from the Norwegian State Academy and Guildhall School of Music and Drama, London, studying with Prof. Detlef Hahn. She was former a violinist in Stavanger Symphony Orchestra, but in recent years she has performed with her Ensemble Ernst and colleague pianists. Her first solo-CD, and Quartet-CD was both nominated to the Norwegian award “Spelemannprisen”, and in 2005 she received from the Norwegian Composer Society the award: “Performer of the year”. She has performed a great number of works for the first time, and she has performed Norwegian recent works in concerts and festivals all over Norway and in Paris, Rome and London. She also now works with improvisation and “Open Form” and released with her pianist, Else Olsen S., her new CD at Bergen International Festival 2010.